Our scenario-based methodology allows you and your stakeholders to connect the dots, and make the important strategic shifts. 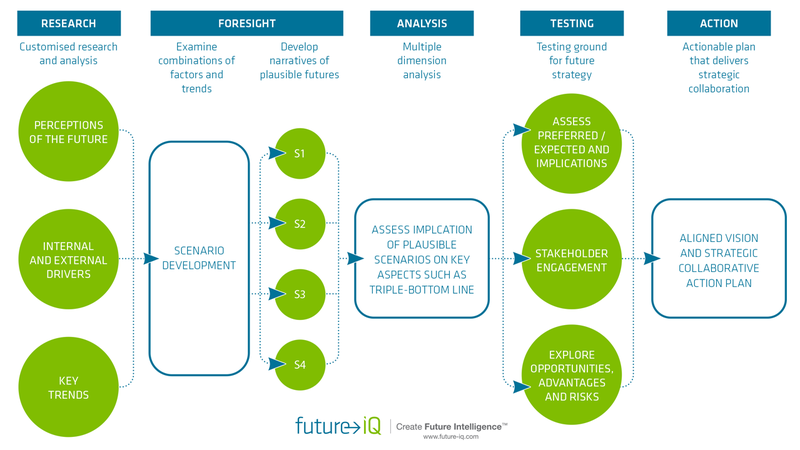 Future iQ’s® unique Decision Path process is a scenario planning methodology which combines data-driven research, with high quality stakeholder engagement. Our expert facilitation produces systemic change and collaborative behaviour, aligned around a shared vision and action plan. Our extensive stakeholder engagement and data visualisation methodologies allow identification of consensus points and shared future vision. Decision Path scenario planning enhances your strategic foresight capability, and the ability to anticipate and rapidly respond to change. Our process drives the formation of intelligent networks, which accelerates information flow, and stimulates appetite for innovation and creative solutions. The action plan defines a clear pathway to your preferred future, and aligns resources with areas of immediate need. With more than a decade of specialised experience, we have engaged more than 25,000 key stakeholders throughout industry, government, community and corporate sectors. Our Decision Path scenario-based methodology allows stakeholders to thoughtfully and objectively explore emerging trends and future strategic options, whilst taking into account complex and interrelated factors in today’s rapidly changing world. This 3 to 6 month process includes stages of research, foresight, analysis, and validation; and, ultimately produces an aligned vision and strategic action plan.